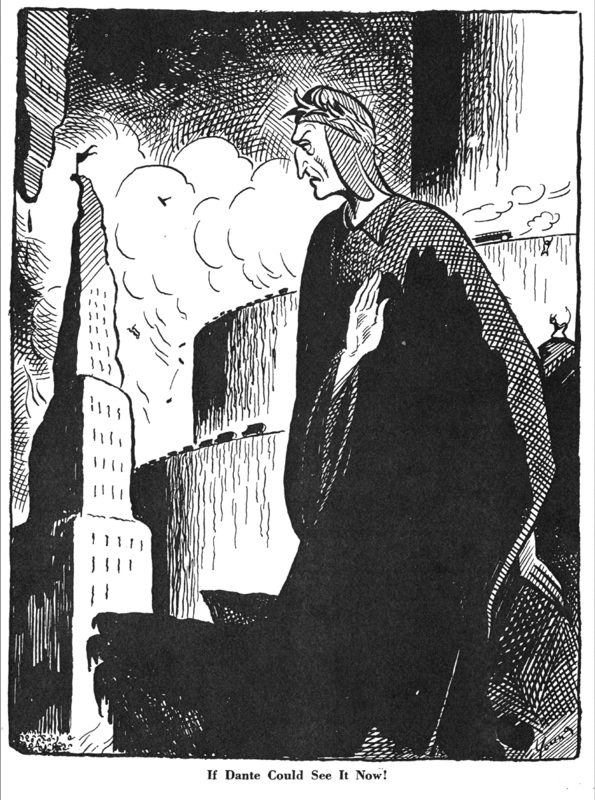 Art Young’s Inferno: A Journey Through Hell Six Hundred Years After Dante, 1934. 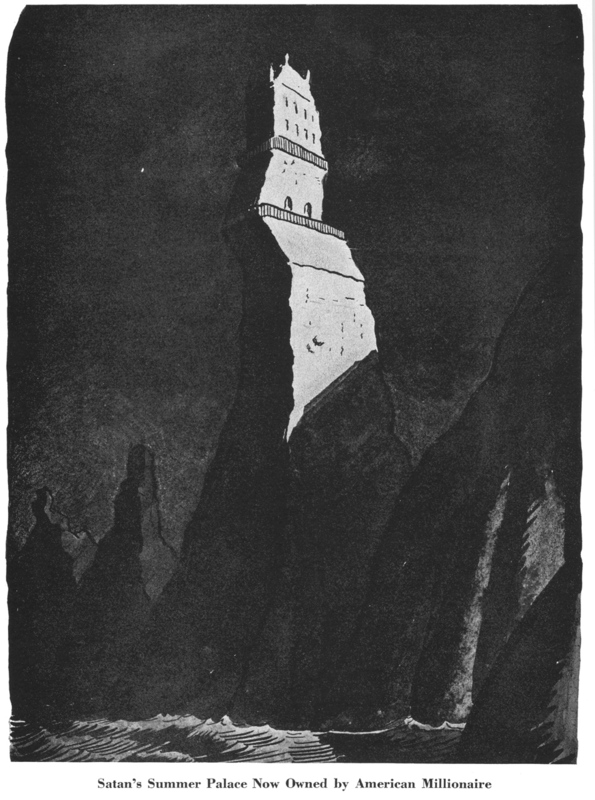 Art Young's inspiration for his journeys through hell from 1892. As a child, Young most vividly recalled falling in love with a large volume of Gustave Dore's engravings of Dante's Inferno. Out of this youthful inspiration sprang a life-long comic project. It is a sign of Art Young's ambition, or perhaps his modesty, that he made three attempts to update this epic journey. They also frame his career between the young midwestern comic to the old radical cynic. R. Palasco Drant visits Satan's private office in 1892. The second trip, published in 1901, is a rather explicit re-working of the first, re-using many of the original compositions with cleaner lines, a refinement towards simplicity that marked Young's maturing style. On this journey the humorous Drant is replaced by the rather humorless Hiprah Hunt, a version of the populist preacher. 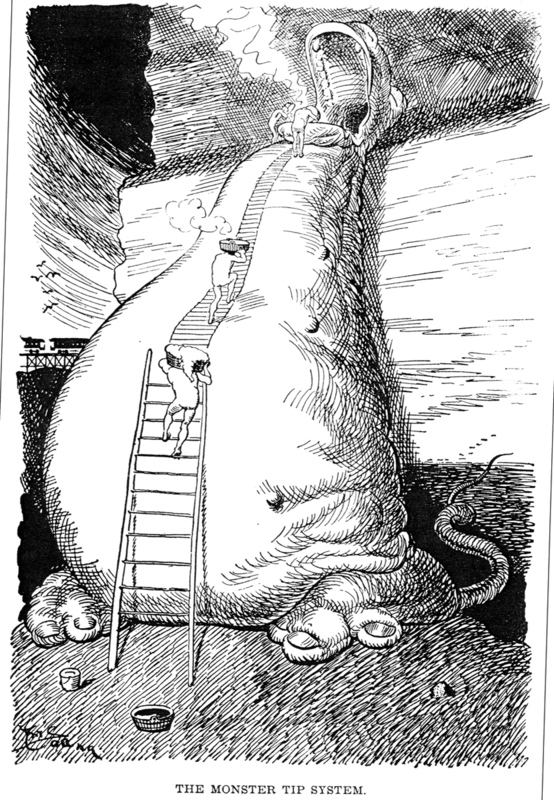 Through Hell With Hiprah Hunt (New York: Zimmerman's, 1901). Hiprah Hunt visits Satan's new office in 1901. Cartoonists in Hell, 1901. Click image to enlarge. 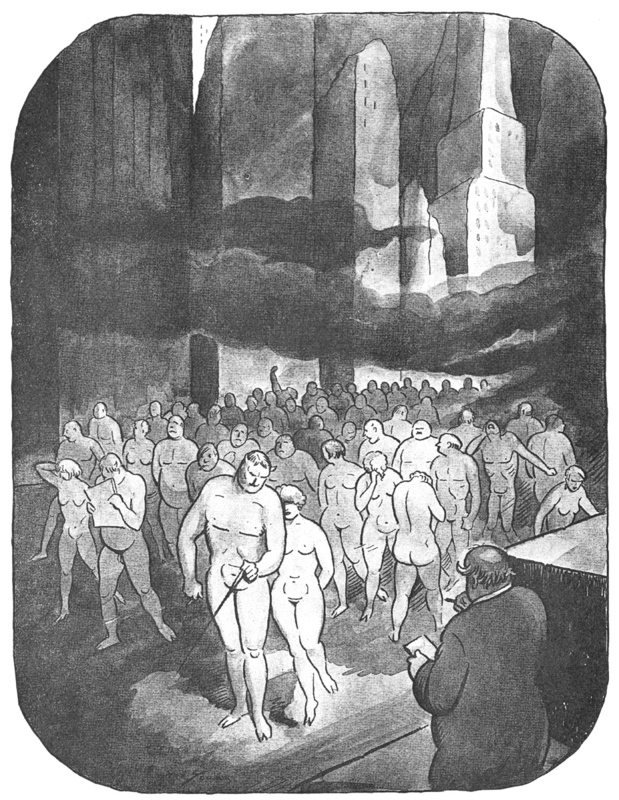 Art’s last major work, Art Young’s Inferno published in 1934, was his third book-length updating of Gustave Doré’s famous engravings of Dante’s Inferno. With so many of their class condemned to Hell, the capitalists have effectively led a hostile takeover, deposing old man Satan and transforming the Inferno into the last refuge of the free market. In Young’s vision, capitalism seems to naturally thrive in Hell. Everything in this new Hell is privatized and operated by a monopoly, maximizing both profits and inconvenience. “All of the natural resources are owned by monopolists,” comments Young with an absurd calm. The Hell Water Power Co. is the single most powerful entity in Hell, and their fire department (with twenty book keepers to each fireman) won’t put out your burning home unless you pay for the water first. Parks charge admission and cool breezes cost a dollar. Highways charge a toll each and every mile. Hospitals will only treat sinners who can pay for their treatment (“the fraternal racket of gouging the sick”). And real estate speculating has grown so fevered that caves are rented for king's ransoms. Most ordinary sinners have taken to sleeping on the streets. This entire book is one of the lost gems of anti-capitalist humor and a priceless assault on the logic of free market capitalism that may be more relevant now than it was 70 years ago. Real Estate is king in the new Capitalist Hell. While rich sinner compete for prime residential properties in the ancient city, rent in the poorer parts of Hell continues to rise beyond what most ordinary sinners - let alone the natives of Hell - can afford. Its gotten so bad, with all the old districts rapidly loosing so much of their former charm, that Hell's oldest and most famous travel writer doesn't recognize the place. Dante seems to think this new Hell is too posh and touristy for poetry. "Hypocrisy is no longer the mortal sin that it was rated in Dante's time. Under the new policy a good hypocrite with ambition, education, and ready speech ranks high in public affairs." 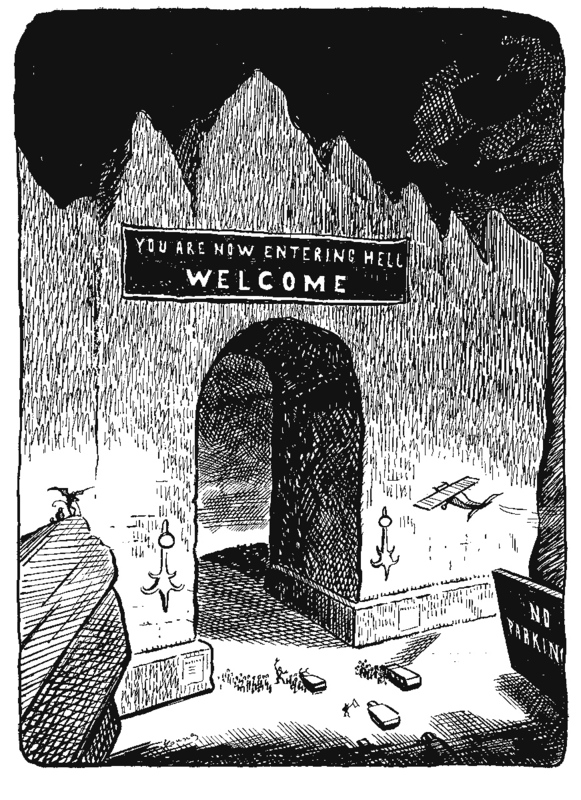 Art Young's Inferno, Looking at the Sinners. Three images of class and society in hell. At the top of the ladder, we see Satan sitting on the throne as the chairman surrounded by his board of directors. Below them (left), Art observes the procession of struggling middle class sinners. They are still naked, as in Dante's day, but no longer flayed and burnt. Now they they suffer in a small-minded way, more anxious and self-deluding. Above we see the class ladder itself, abstract even for a vision of Hell. This is not Art's Protestant view of Purgatory, with the elect climbing their way out of sin and unto salvation. No, it is the struggle against your fellow men and women to climb up the ladder away from the masses of the poor to the precarious top that creates a Hell for everyone. Art Young's Inferno, The Big Parade. Art Young's Inferno, An Art Gallery. Art looks here to be in good company, especially with the rather, lets call it devilish grin on his face. Perhaps he's spent too much time in hell and taken a liking to the beasts who make up both his subject and his audience. These are the indigenous inhabitants of hell, the lesser imps and demons who, like Art himself, spend their days tormenting morally condemned capitalists.